The scenes of summer are here and the kids are buzzing around the house with no school to busy their minds. You need to get away. So pack the car, gather everyone—grandma included—and take an old-fashioned road trip across North Carolina. From the western reaches of the Blue Ridge Mountains to the sprawling dunes of the Outer Banks, a drive across the state offers plenty to please each member of the family, young or old. When grandma’s feet get tired of scaling scenic peaks, head two hours north to Blowing Rock. This little town is a tourist’s favorite, full of shops and restaurants. Grandfather Mountain is nearby, where you can walk the Mile High Swinging Bridge and watch bears in the pristine wildlife habitats. Grandfather is only a few minutes up the mountain from Tweetsie Railroad. This Wild West adventure takes you through the mountain terrain in an historic coal-powered steam engine, all while cowboys and Indians battle around you. Tweetsie Railroad is a step back in time with plenty of games and activities to entertain the whole family for a day. After you’ve had your fill of fun in Blowing Rock, head down US-321 to Charlotte. The U.S. National Whitewater Center has zip lines, obstacle courses, mountain biking, kayaking and white water rafting. Here you can paddle a gentle stream as a family or leave grandma at River’s Edge Bar and Grill and take on some serious rapids—it’s up to you. You can find a number of pricing packages online, depending on what activities you like, and if you decide to stay through the day, check out the concert schedule. The facility hosts live music on Thursday and Saturday, May through September. All River Jams are free with a $5 parking fee. Every family vacation needs an educational stop. With an immersive historical setting and on-site museum, your family will get a first-hand understanding of what life was like in the Carolinas long before kids complained about cell phone batteries and download speeds. From Old Salem, take Interstate 40 east until your map turns blue. Then wind along the coast toward the Civil War-era Fort Fisher, a national historic landmark and namesake of the Aquarium at Fort Fisher. With thousands of species of sea life, the Aquarium is a wonderful way to spend a day. Programs and activities run all the time and include outdoor explorations. What’s even better, if the parents need a break from the kids, the Aquarium offers summer camps. All you have to do is sign up the youngsters, sit grandma near the shark tank and escape to Wilmington for the day to eat and shop along the waterfront. If the family is still speaking after your trek across North Carolina, ride up the coast to Kill Devil Hills and visit the Wright Brothers National Memorial. This is the longest drive of the trip, almost five hours long, but seeing the Outer Banks is worth hearing the kids ask “Are we there yet?” a thousand times. At the memorial you can explore where man first conquered the sky and the kids can run and play in the open spaces. The Wright Brothers National Memorial is not far from Jockey’s Ridge State Park where you can climb towering dunes. If you’re feeling brave, rent a hang glider and take a quick flight of your own. 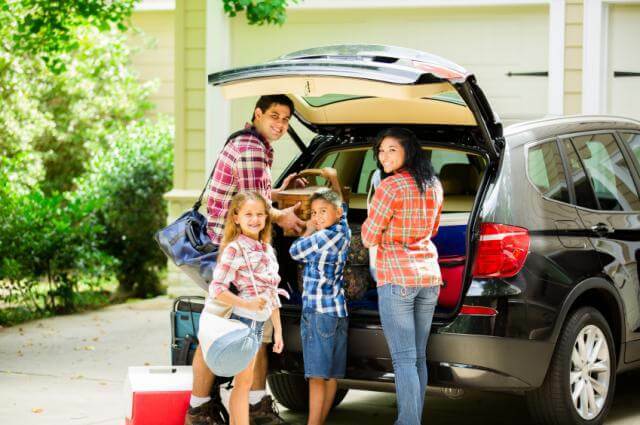 A road trip with the family is a chance to make memories that will last a lifetime. Adventures are, as we all know, also opportunities for scrapes and stumbles. Whether some bad butter turns your tummy in Old Salem or a trail in Chimney Rock leaves you limping, remember FastMed is always available to help you get back on your feet. We hope you don’t need us, but we have locations across North Carolina in the event that you do. And check out the Pratt Family as they navigate an American Summer like your family!